The Itsy Bitsy Spider Crochet: Pumpkin Patch CAL Update! Hello friends! 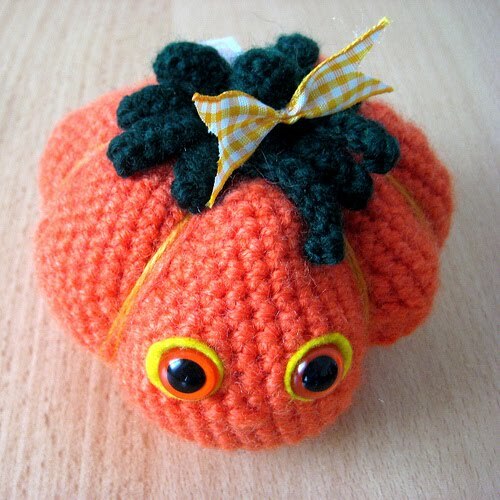 I am BEYOND excite to announce that we have 120 participants signed up for the Pumpkin Patch Crochet-Along! The sign-ups are officially closed now and the last of the free patterns have been mailed out (although you can still get all three of the pumpkin patterns on Ravelry for only $1.00 each or as a bundle in my Etsy shop for just $5.00). If you signed up and did not receive your pattern, please send me an email at ibscrochet [at] gmail [dot] com. Also, if you haven't gotten out to the Flikr group yet, put it on your to-do list! There are already some photos of some great and inspiring pumpkin ideas and more rolling in every day! The first CAL lesson has also been posted (materials list) and more will be coming very soon. So make sure you check back on the blog often. In the mean time, happy crocheting! I've finished my pumpkin but can't get a photo until at least tomorrow. But I do hope to post a photo in the Flickr album sometime tomorrorw.